Homeschooling is growing quickly in the United States and Canada. Every year, learning how to home-educate your children and finding easy resources becomes easier. There are now about 200 homeschooling book fairs, conferences, and conventions each year with more than 1,300 speakers who provide their expertise. Although homeschooling is legal in every state in the U.S. and every province in Canada, there are differences from state-to-state. 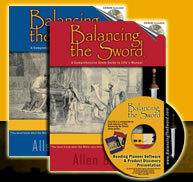 Thankfully, children can earn middle school and high school credit by studying the Bible using Balancing the Sword. Could there ever be a superior source document for earning literary credit than God's Holy Word?